Hi friends, today is a day I have waited for a long time. 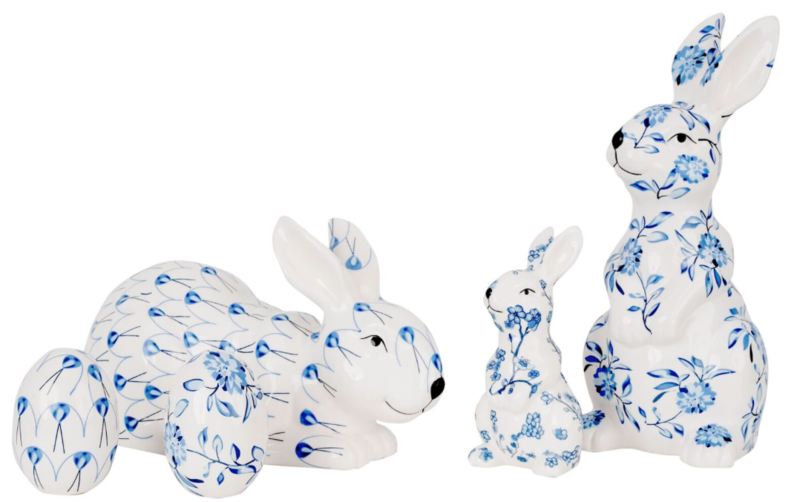 My beloved blue and white bunnies, eggs and the newest collection of the giftwrap all became a beautiful reality! They are on the way and due here within 2 weeks possibly even a little sooner. One is as cute as the other. I just love these so much, they are perfect for display year round. I have one customer who wants to order them for a baby shower centerpiece (love that idea). Offered in three sizes/three patterns. To me they look the best all together but I could also see a matching pair. 1D The 3 piece set. Buy all three and instead of paying $158.00 you pay $140.00 for all three! ITEM 2 . The eggs come in one of four styles. They are 3.5″ tall and are handpainted. 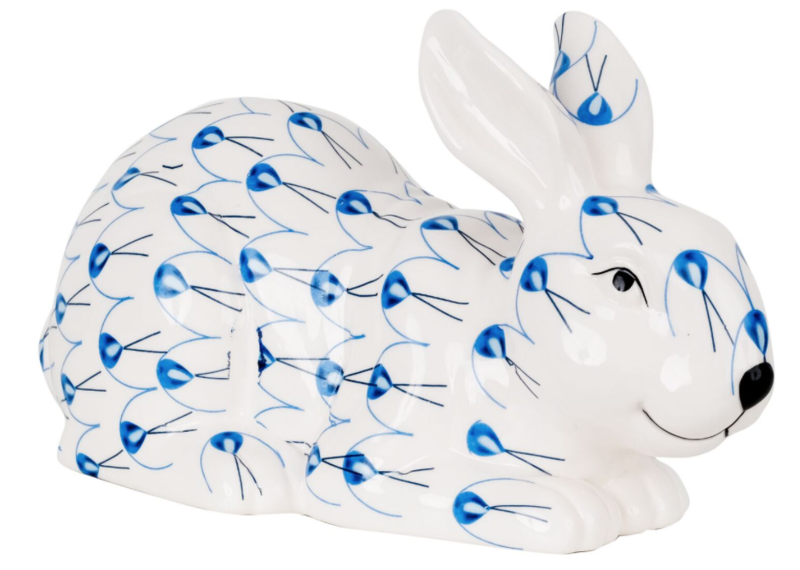 Great collectibles and beautiful paired with the bunnies. (two we don’t yet have the professional pictures back of) ALL BLUES ARE THE SAME BLUE though in these pictures it may look like they are different colors of blue. This was a long time in the making but so worth it, it is absolutely beautiful, I made paper I wanted to find, classically beautiful paper that is as unique as it is gorgeous. When I couldn’t find it, I created it! ITEM 3B. The stunning blue/white planter and boxwood giftwrap is amazing. Each roll is 5.5 feet by 30″ and they are reversible. TWO ROLLS for $16.00 OR FOUR ROLLS for $30.00. ITEM 3C The lemon topiary is so fresh and happy. Each roll is 5.5 feet by 30″ and they are reversible. TWO ROLLS for $16.00 OR FOUR ROLLS for $30.00. ITEM 4. THE REAMS OF PAPER. Sometimes you love a paper so much you want to be sure you have plenty that will last a long time. That is when a ream comes in handy! I know I will be keeping a number of them for myself. Reams measure 204 feet by 30″. All patterns are offered in the ream, remas generally sell for around $300 per ream so these are exceptional deals. ITEM 5. The blue and white gingham ribbon many have asked about, it is a beautiful compliment to both topiary papers. Available with a giftwrap order, this 33 yard roll (1.5″ wide) is $18.00 with the purchase of giftwrap. One lucky winner will win four rolls of her choice. Simply leave a comment telling us your two favorite items on this post, I will announce a winner on Sunday! Thanks as always for stopping by, wishing you a wonderful day. Until next time….. The topiary papers make my heart flutter! The eggs…I have a collection of Russian eggs…these are a perfect addition. All just FABULOUS!!! I want it ALL! The pale blue with gold and pale pink with gold grift wraps are really spectacular! Just beautiful. I love the lemon topiary paper and the gingham ribbon!! The bunny family is fabulous! Love, love the blue/white planter with boxwood gift wrap and the blue gingham ribbon! 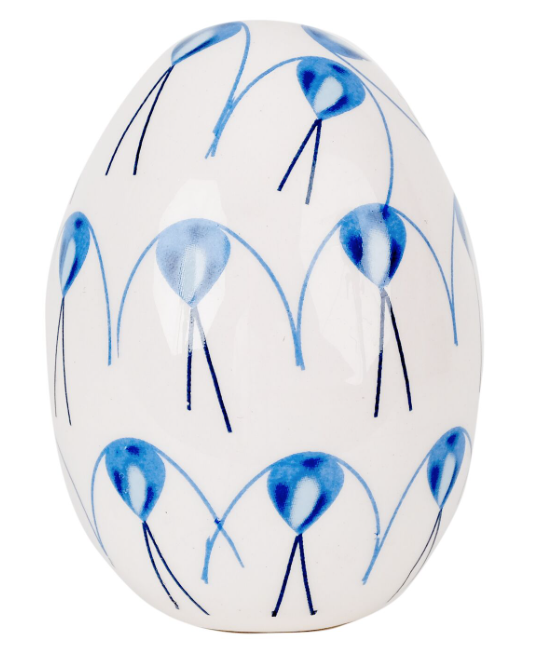 All 4 eggs are lovely and will look perfect with a collection of marble eggs that I have treasured forever! Now 4 more to treasure! The blue/ gold paper is my favorite with the gingham ribbon! The papers are gorgeous and really like the blue and white eggs. 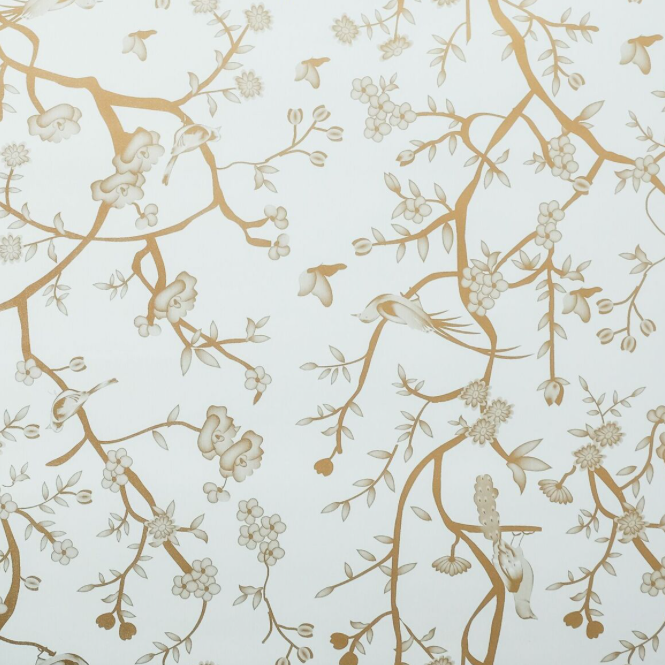 I absolutely love the romantic and gracious look of all the gold chinoiserie wrapping papers. I am imagining the luxe feel of it and as someone who takes enormous pleasure in wrapping and giving gifts for loved ones, it will only add to the glee of watching someone “OOH” and “AAH” over receiving such a handsomely prepared gift. The Bunnies are just too cute and what a wonderful idea to use them for a Baby Shower centerpiece! Loving the lemon trellis paper and gingham ribbon – why is it that gingham seems to go with almost everything (and it always makes me smile!)? I love the bunnies and the lemon topiary paper! The bunny family is adorable! Many places and times of the year when I could put them out to be admired! I love the eggs with all the different looks. Perfect for year round display. I have just the right place for them. Then if I buy a few extra, I can gift wrap them and tie them with that gingham ribbon. Perfect! I love the pale blue with gold, pale green with gold and boxwood topiary with trellis papers….unlike anything I’ve seen in stores! So many beautiful choices! Will definitely order several. GORGEOUS! Every single piece, I am putting my order together, you did good Tina! the gift wrap paper is so pretty. love the boxwood trellis. 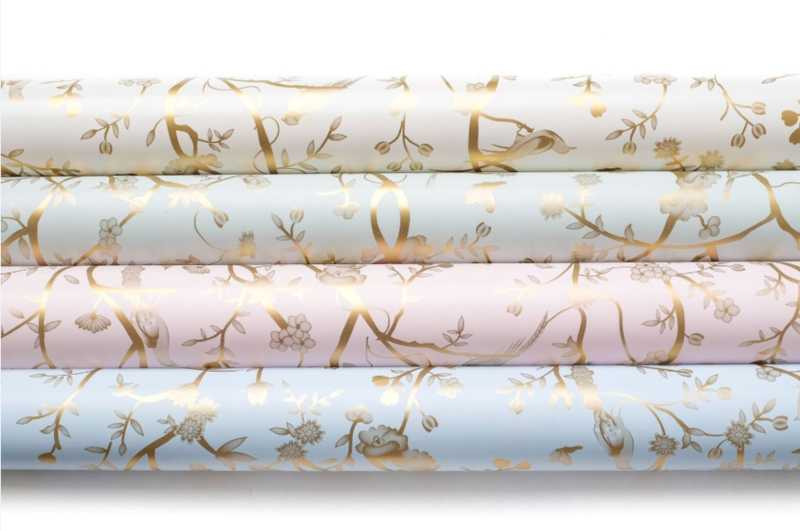 Your wrapping papers are the prettiest ever! My favorites are the topiary papers, and that gingham ribbon!! Just lovely! My favorite is the blue & white planter/boxwood and ivory chinoiserie papers. Each will enhance gifting with elegance! My favorite is the boxwood with trellis. You can put a red ribbon on it for Christmas and a pink/yellow ribbon on it for Spring. Love it! 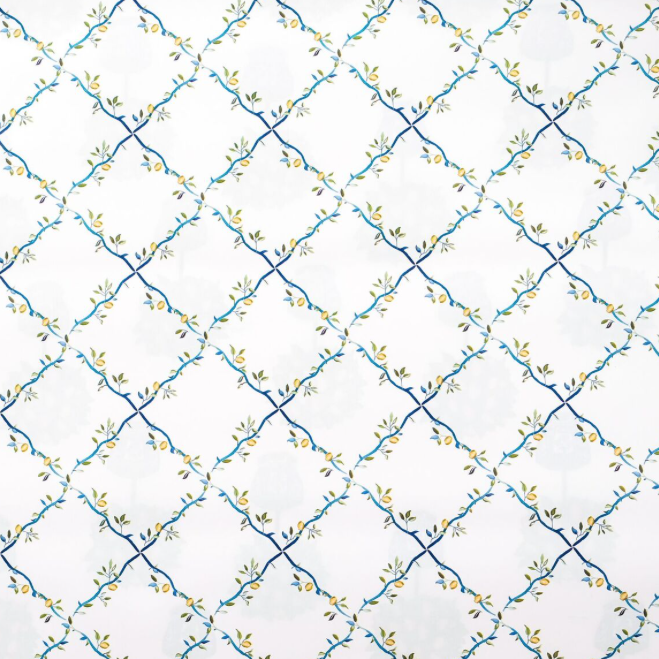 Wow, the chinoiserie wrapping paper is gorgeous! All four colors are beautiful! Can’t decide which I like best. Love the topiary giftwrap paired with the gingham ribbon! 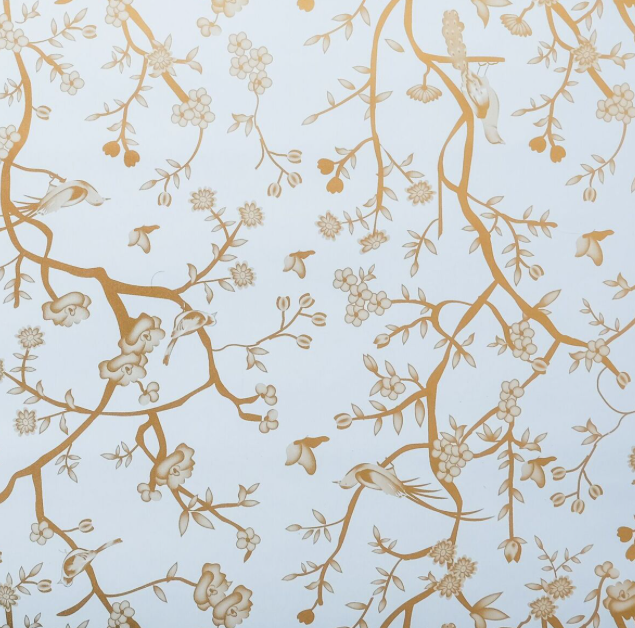 I’m absolutely smitten with the pale blue/gold and ivory/gold chinoiserie gift wrap! The blue and white ribbon really sets off the paper. very hard to not just love the lemon topiary and boxwood wrapping paper – and i LOVE cherry blossoms, so those eggs are calling my name! Thank you, Tina! Love the gift wrap and ribbon. I will be placing an order. LOVE the eggs and the topiary paper. Need to get some for myself! Love the new boxwood paper! 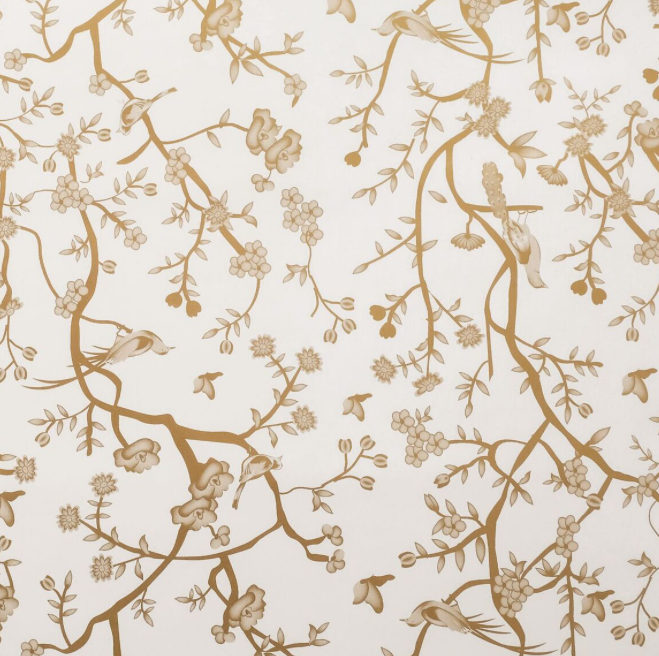 Hi Tina- I would love to see gold chinoiserie wallpaper just like the gift wrap! It’s all so beautiful but my favorites are the cherry blossom egg and the boxwood with trellis wrapping paper! Amazing!! I love them all but my two favorites are the blue and white planter with boxwood paper and the gingham ribbon. 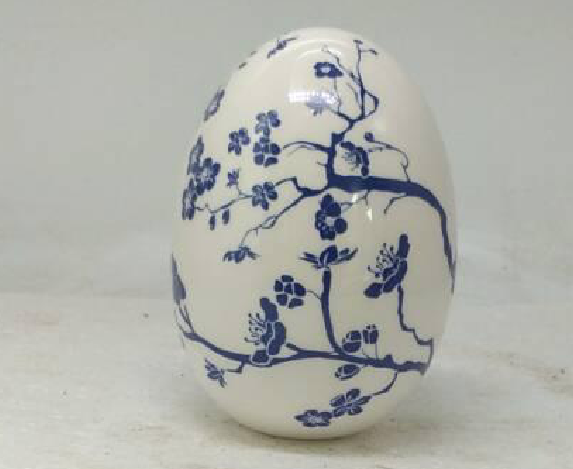 The cherry blossom eggs and the chinoiserie paper are gorgeous!! I love the lemon topiary wrapping paper! It is just FUN! The two favorite items with your post are the gingham and the refreshing look of the paper. And I must add the charm and beauty of all your posts which balance out this world. The lemon topiary is my favorite. Perfect for any occasion. I love the boxwood giftwrap with the gingham ribbon!!! 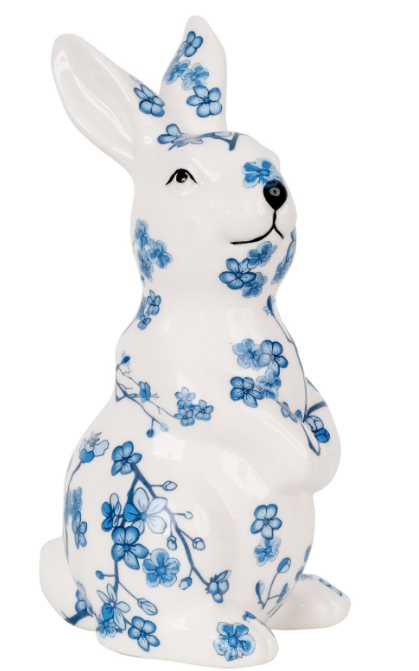 I collect porcelain bunnies so I particularly like the floral patterns. That lemon topiary paper! Actually all of the paper patterns are wonderful. My two favorites are the lemon topiaries and the boxwood topiaries in the blue and white planters. The lemons remind me of the Amalfi Coast. I think the gingham ribbon is a must to go with all of it. 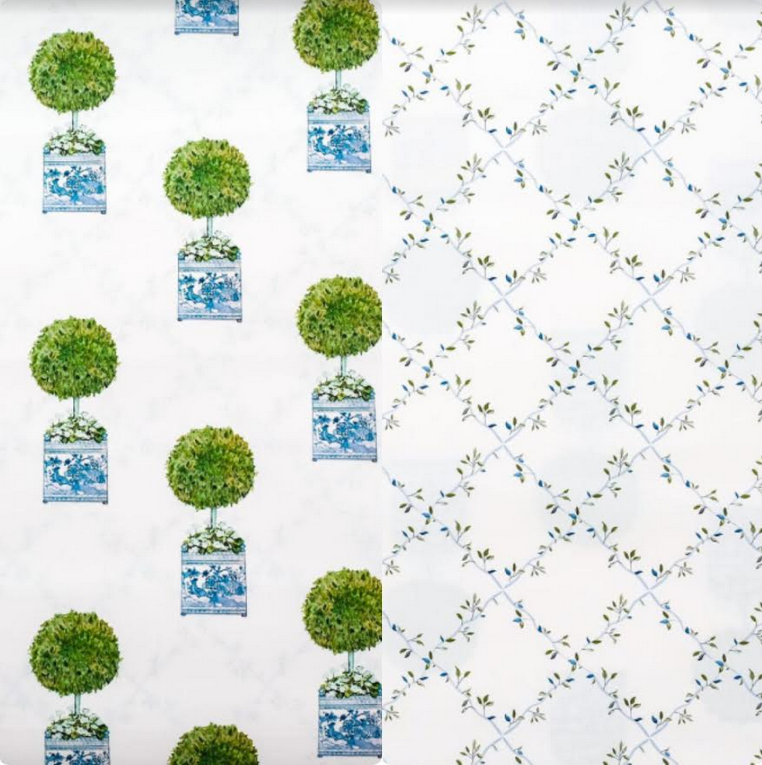 Love love love the lemon topiary gift wrap and the boxwood trellis gift wrap!! So ❤️ The boxwood paper with the gingham ribbon! 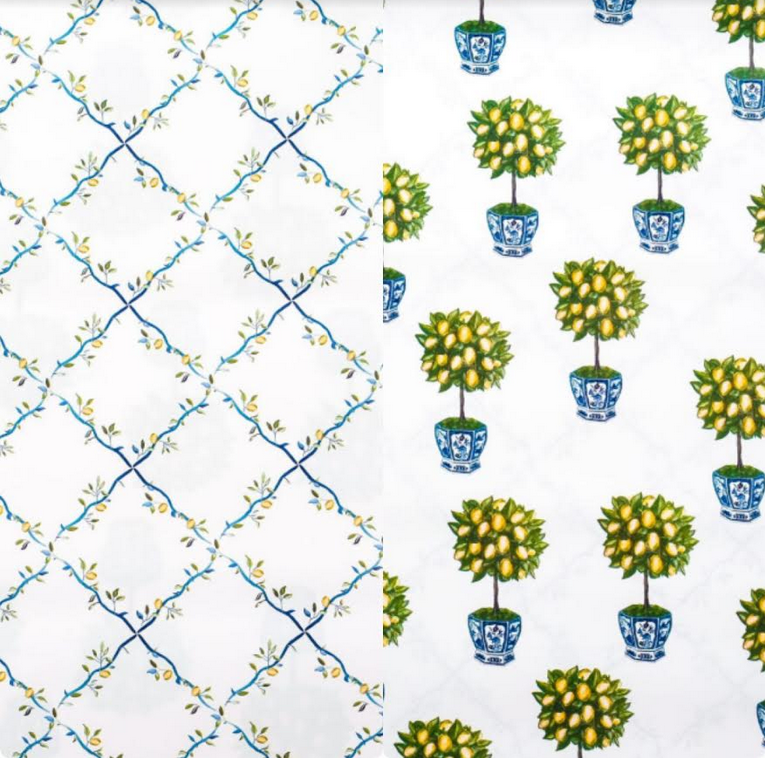 The Lemon topiary and the pale green chinoserie are gorgeous!! I love the lemon topiary and the boxwood gift wrap! It’s by far the prettiest giftwrap paper I’ve ever seen! LOVE them all! 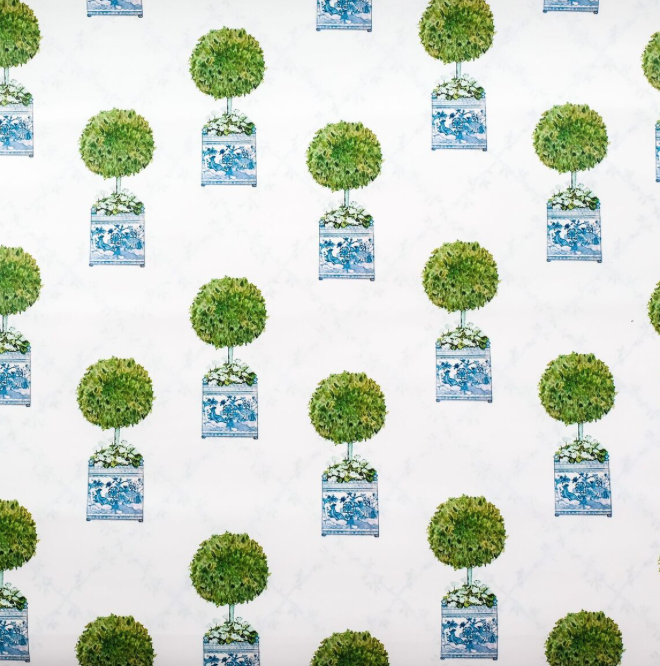 The lemon topiary paper and boxwood topiary papers are gorgeous – want them to live at my house! I love the boxwood and the lemon topiary paper with the gingham ribbon. Classic look. 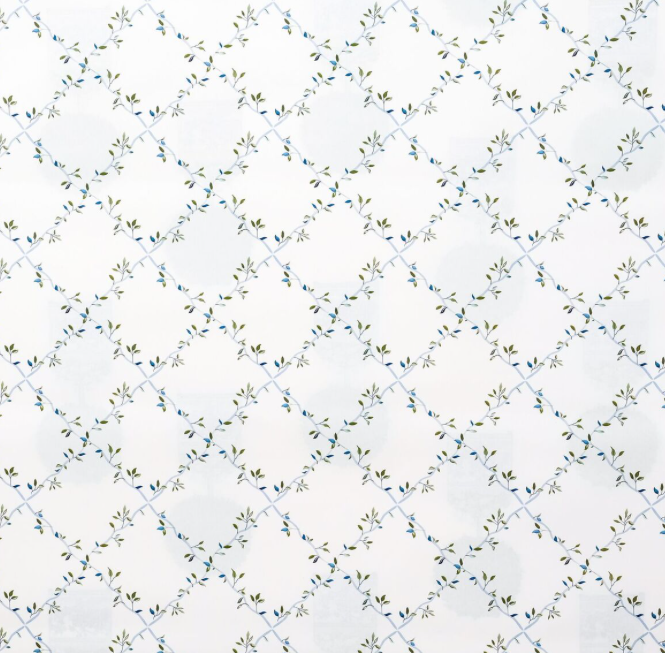 The Gingham ribbon & trellis paper is adorable! I love the bunnies… How about some pumpkins for next fall? Thanks so much! All papers are gorgeous! And the ribbon–love it! Love the standing bunnies and the lemon topiary gift wrap! Love the big bunny and the the lemon topiary paper! Love, love, love the lemon topiary wrap and the gingham ribbon! 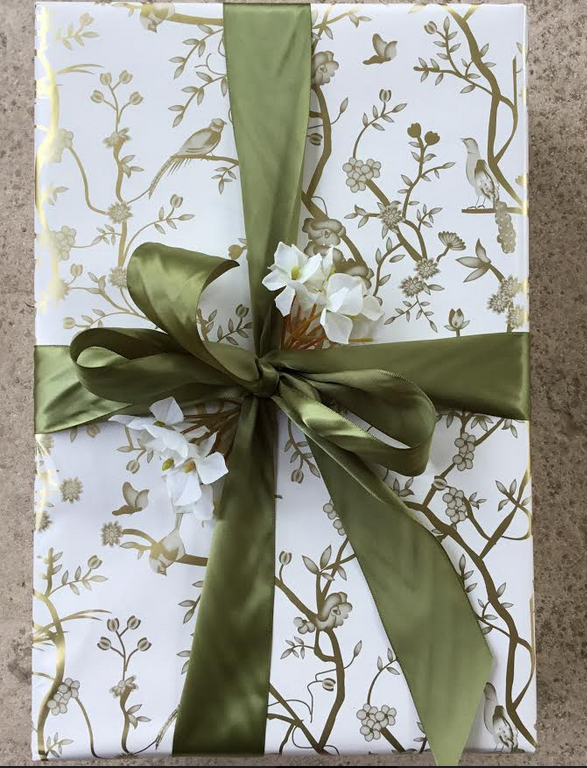 Love the bunnies and eggs, but yes, the wrapping paper is absolutely beautiful, gorgeous! Papa bunny is very cute, but I think my favorites are definitely the gold chinoiserie papers in ivory and pink. They will make beautifully wrapped gifts. Love the gold and ivory. A beautiful touch for any special gift! Also smitten with the gingham ribbon. So nice! Some bunny (me) loves all the bunnies and the eggs, simply beautiful. The wrapping paper is simply to put it in one word, “wow”, way too pretty to cut. I love the paper with the lemons, but I would love to receive a gift wrapped in any of them. Have a great day. I taught preschool for many years, and our class was the “bunny” class, so the bunnies are perfect! Love the eggs, would go perfect with my egg collection. Those bunnies are so cheerful! Amazing, that the paper is available by the ream. Love the check ribbon! I love the cherry blossom egg and of course ALL the wrapping paper! The eggs – exquisite! AND …. LOVE all the wrapping paper!!! Difficult to choose but right now the boxwood wrapping paper with the gingham ribbon is calling my name. Love the topiary trellis paper and the bunnies are amazing… You have a beautiful design sense… love ALL your products!! 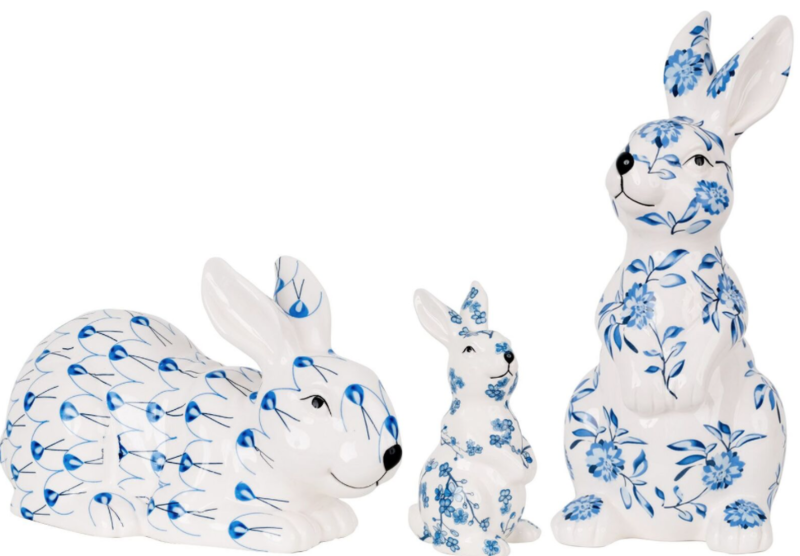 Mama bunny and the Chinoiserie wrap! 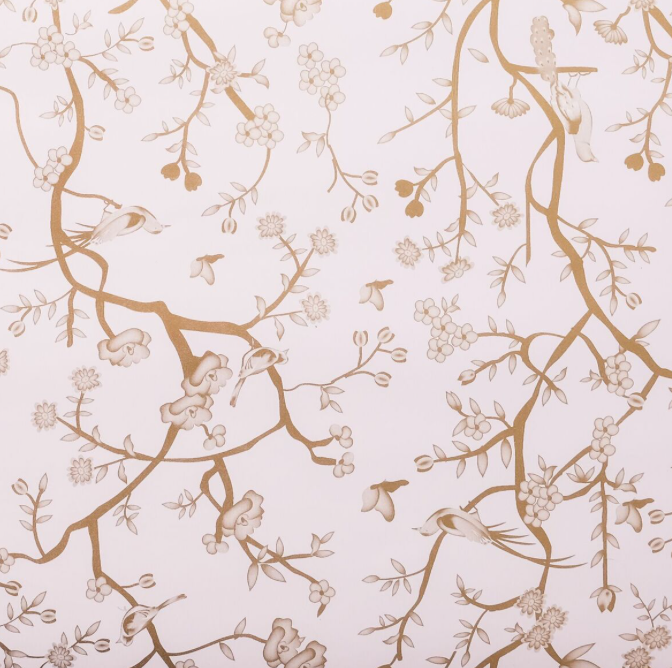 The cherry blossom eggs and gold chinoiserie papers are wonderful!! I can’t hardly wait to see this gorgeous paper and start wrapping !! I love the 3-piece bunny and the white cherry blossom egg. Beautiful! Absolutely love the paper. My faves are the chinoiserie in ivory and mint. This would be my go to gift wrap every time. Beautiful! Oh my! Tina, you have nailed it again. I absolutely love the pale blu and gold chinoiserie paper along with the green and blue boxwood paper. You truly do make the world a better place. Thank you for sharing your many, many talents with all of us. Love love the paper! Love to give an egg to someone that has lost a loved one. I always write a note that the egg is a sign of new life and ressurection. The Three Bunnies (1D item) is my favourite! They would be a perfect gift (to myself) wrapped in the Gold Chinoiserie Paper (Item 3A). How nice! Beautiful selection. I love the lemon topiaries and the chinoiserie collection! Lemon paper and gingham ribbon- so cheery!! Wish I had this 17 years ago for wedding favors! I used lemons in my wedding centerpieces and I will always be fond of lemons! 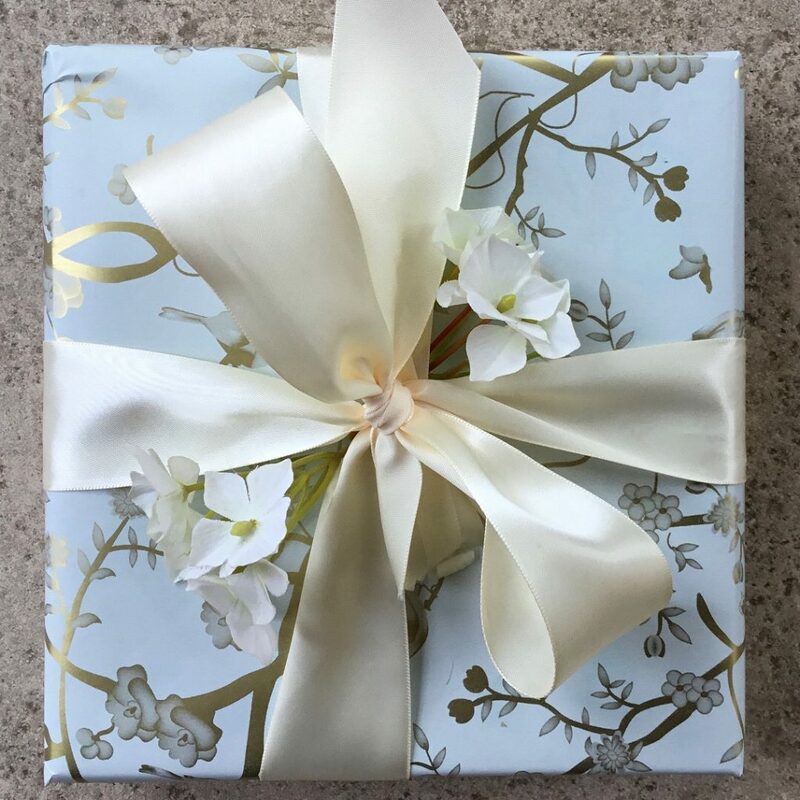 Beautiful packages make my heart skip a beat, especially with lemons and boxwoods… can you imagine receiving a sweet bunny all decked out in this beautiful wrapping paper…oh my, now I’m doing the bunny hop!!! I LOVE the blue gingham ribbon. I already have a lot of the giftwrap, I just might have to buy a little more. New papers are lovely. Bunnies, adorable. The bunnies and pale blue /gold wrapping paper are my picks. The planter and boxwood paper and the pale blue chinoiserie paper are my favorites! Love using your gift wrap to make gifts special. 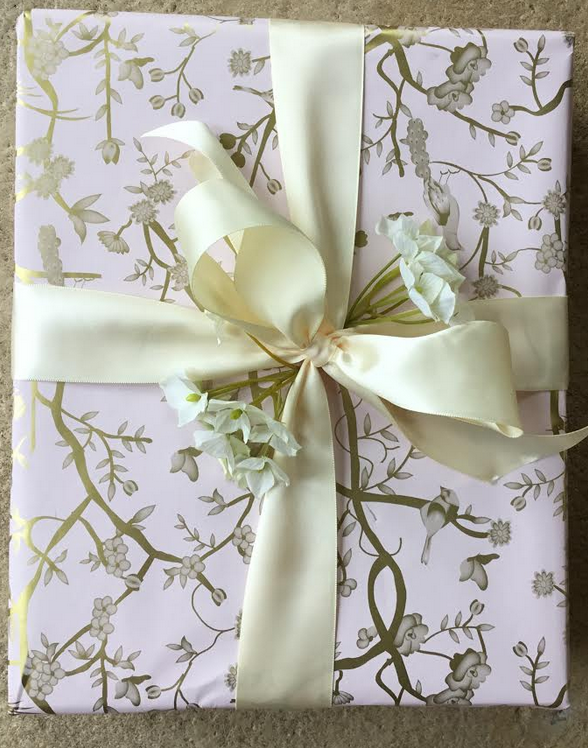 My favorite items are the pale pink w/gold gift wrap and the lemon topiary gift wrap! I like all items on this but if only two…I would choose the gift wrapping. My family and friends faces light up with pretty wrapping paper and ribbons. I’m looking forward to receiving the rolls purchased this morning. They appreciate those special touches. Second, is the pictures of Teddy(now gone but never forgotten). . I love golden retrievers. I send Teddy’s to my niece who is NYC school teacher and all alone. 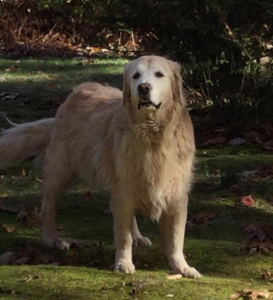 She misses her family’s golden retriever dearly. Teddy’s smile brings one to her face. I love the boxwood with trellis and the lemon topiary papers. The blue gingham ribbon adds so much also. Love the lemon trees. Great choices. Really love the boxwood topiary in the planter. It could be used for every occasion. Also love the bunnies, the mama bunny is especially cute. Love the details of the new giftwrap … the gold foil is spectacular! The cherry blossom eggs and the pink and gold wrapping paper are beyond beautiful to me. Love the topiary and lemon tree gift wrap!! Love, love, love all these items! The eggs are delightful and the gift wrap papers are beautiful! Love the bunnies, eggs, lemon topiary and pale blue chinoiserie papers. The gingham ribbon is so French country. I love bunnies and have many though these would be out all year long. My favorite is the baby bunny and the Blue gingham ribbon! The boxwood with trellis paper is to die for!!! 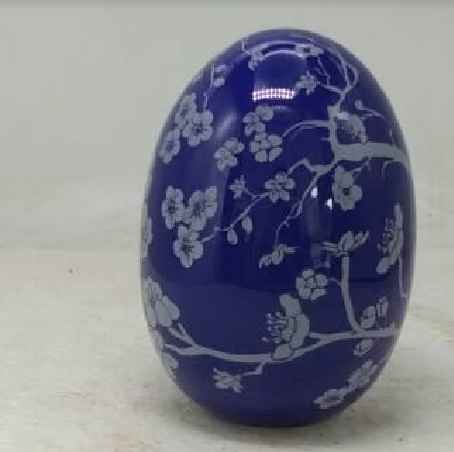 The eggs are also so beautiful for spring. Love. Everything! I especially love the chinoiserie paper. I can just picture the blue and the pink to wrap a baby gift, so elegant. WOw they are all wonderful products!!! I love the bunnies and the eggs. I can see the bunnies in so many places in my house, I’m sure they will move around and be out all year. Won’t they be pretty with red bows at Christmas?! I can’t wait for them to arrive! I love item 4B, the blue and white boxwood paper and the blue and white gingham ribbon! I love the baby bunny and the lemon topiary gift wrap. You have so many beautiful things! So excited for this pre-sale. Love the wrapping paper! I love your gift wrap! My two favorite styles are the blue and white planter boxwood with trellis and the lemon topiary paper with trellis. The quality is amazing. 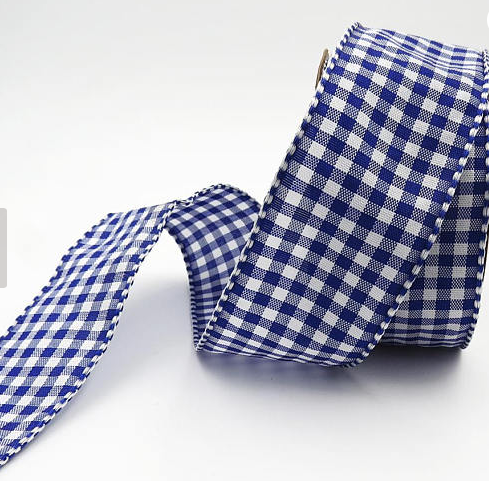 I love that we can now order the blue and white gingham ribbon! Can’t wait to receive my order! Loving your bunnies…and oh my goodness your exclusive giftwrap is so exquisite! I especially like the light pink and light green with gold, as well as the topiary and gingham ribbon. Love the bunnies and the blue check ribbon! I could kiss you for offering gift wrap in reams!!! Anyway, I ordered 2 reams, one boxwood, one lemon!!!! Yes!! Ok… so 3 bunnies, 4 eggs, and 5 rolls of gingham ribbon. My two favorite items are the baby bunny and the boxwood with planter gift wrap. The bunnies make me smile as does the picture of regal Teddy. As usual.. all the porcelain and the exquisite wrapping paper are wonderful! Oh my goodness everything is so gorgeous. I am a NUT for gift wrapping! I love the chinoiserie in all the color ways, and I love the green topiaries. Thank you for the wonderful blog! 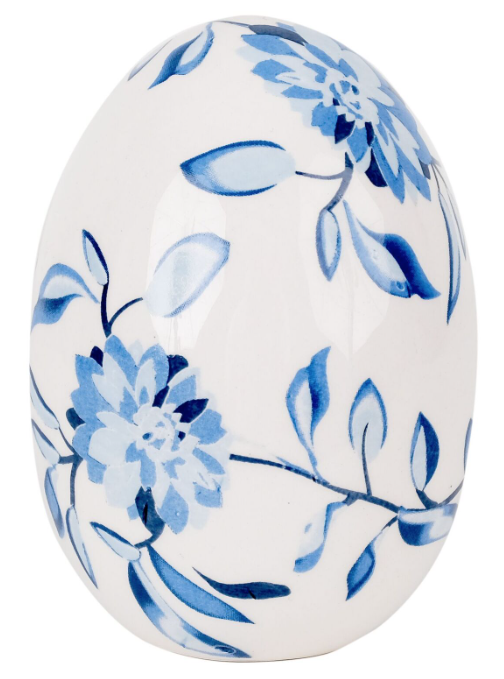 The blue and white gingham ribbon and the blue cherry blossom egg are my favorites! I love the lemon topiary paper and blue gingham ribbon! All of the items featured are beautiful but the topiary paper with the blue and white planter and the floral bunnies are truly stunning. They would be a lovely addition to a blue and white lovers home. Lemons and the gingham! Lovely! Beautiful wrapping paper! Need a few rolls for an upcoming wedding 😄! Love the chinoiserie papers, especially the pink and the white. They match my living room. Hmmmm… I wonder if there might be any way I can use gift wrap as a decorative element. Maybe leave some gift-wrapped packages around in strategic places? I love your new paper! My favorite is the boxwood topiary. Almost looks hand painted! 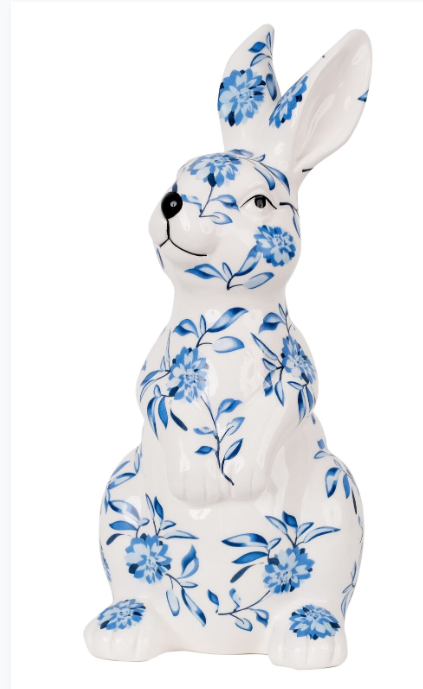 of course all of the bunnies are adorable and would look so pretty on my dining table with my blue and white planter. My two favorite items are definitely the new wrapping paper!! LOVE!! The pale blue w/gold and the ivory w/gold are just stunning. The gifts look too pretty to unwrap! So excited about the gift wrap! Sending in my order tomorrow! Love the Blue Checked Ribbon and the wrap with the Lemon Topiaries!! I adore ALL the wrapping paper and the blue gingham ribbon! I love the bunnies and the gingham ribbon. That gingham ribbon and the paper are my favorites. I like the bunnies and the paper. Not sure I can limit my top 2 choices. I will say baby bunny and the floral egg. Having named those 2—I want them all! I love the pale green paper and ivory paper! The Lemon Topiary and Blue and White Planter papers are just perfection! 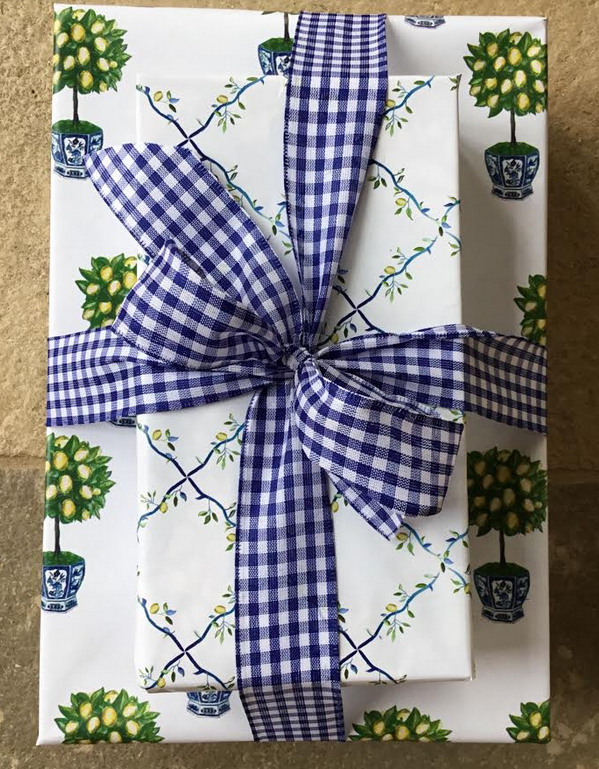 I’m smitten with the both topiary gift wrap designs and the gingham ribbon. I would use the paper for every occasion. Any chance of matching gift tags? The lemon topiary paper is stunning, and so unique! My favorites are the floral egg and the ivory and gold wrapping paper, but all the new products are lovely. Love the eggs and the topiary pictures! So thankful you keep creating! Papa bunny is so cute. But I love the pale green chinoiserie paper and the lemon tree paper with the gingham ribbon. Beautiful! My favorites are the lemon topiary and boxwood planter gift wrap. The designs are so lovely and look so nice with the gingham ribbon. All the papers are beautiful. My favorites are the boxwood and the lemon topiary. Thank you for the giveaway. Love the eggs & the bunnies! I adore the bunnies and the blue and gold chinoiserie paper!! I love the ivory w/gold and lemon topiary gift wraps! The blue and white paper is awesome! The blue and white planters with boxwoods are just amazing. I like them so much, I’m going to decoupage some things with them! I love them all. But I guess my favorite is the lemon topiary!! So hard to choose among so many lovely items. Both cherry blossom eggs and the gingham checked ribbon are my favs. 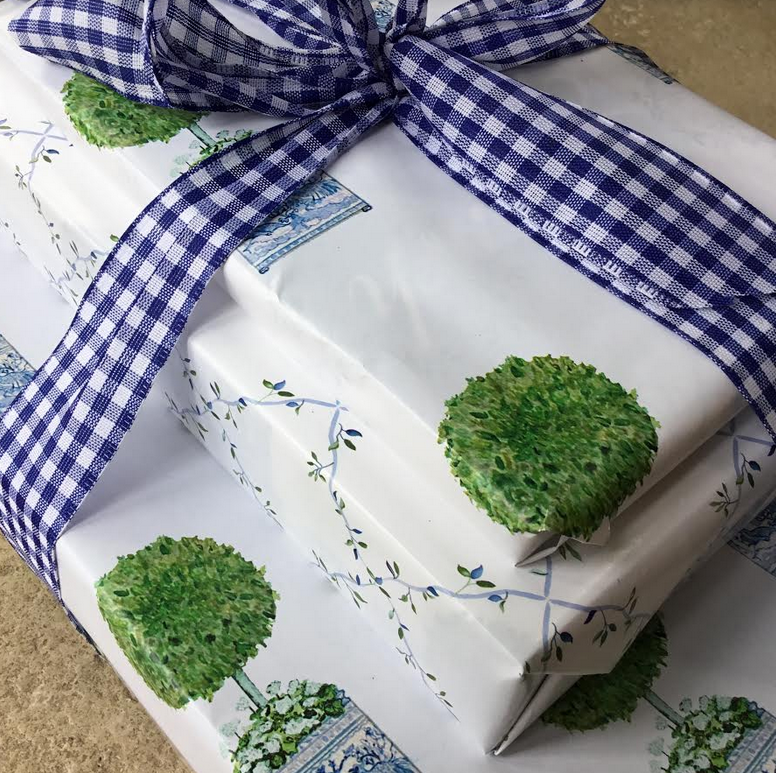 My 2 favorite items are the blue/white planter boxwood tree and the lemon topiary tree gift wrap papers. These are so stunning and unique, something I’ve never seen before in wrapping paper! Thank you for making them available! Love, love, love the bunnies! They are adorable! Love the bunnies, so darling! Cherry blossom eggs are adorable….and all the wrapping papers!! So hard to choose my favorites! Love all the bunnies and the green topiary paper! I love everything you have to offer. 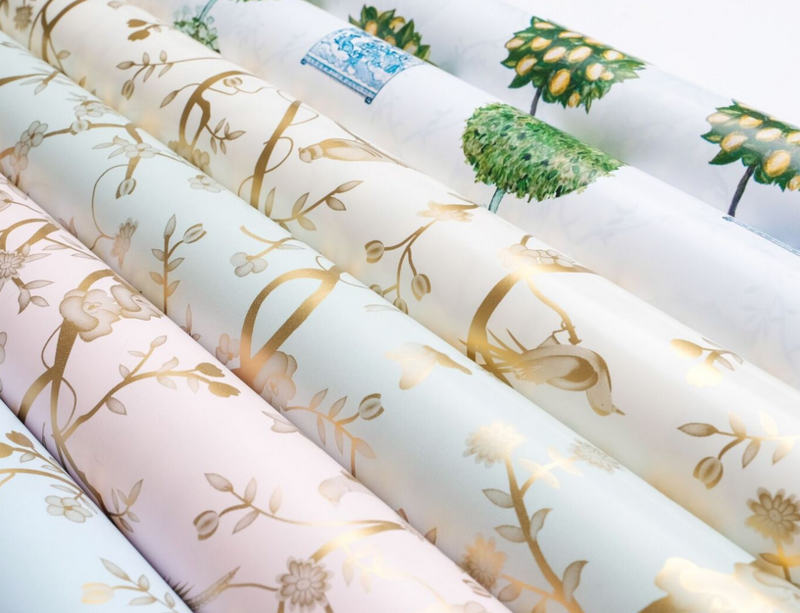 These gift wrap papers are are as beautiful as the gifts they will enclose. Keep up with the originality in your designs- love it!! 3 piece bunny set and white cherry blossom egg. I have been waiting for the ivory/gold paper, but the bunnies are adorable! Love the lemon topiary paper and trellis paper! 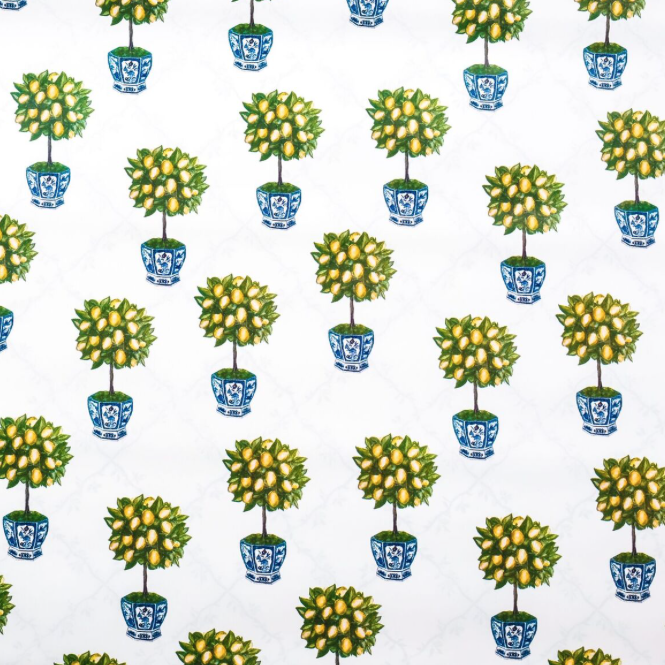 I love the lemon topiary gift wrap! It’s so pretty it makes opening the gift an event. I LOVE the gingham ribbon and have wanted it since last Christmas! I also LOVE all the gift wrap but the topiaries are my favorite! 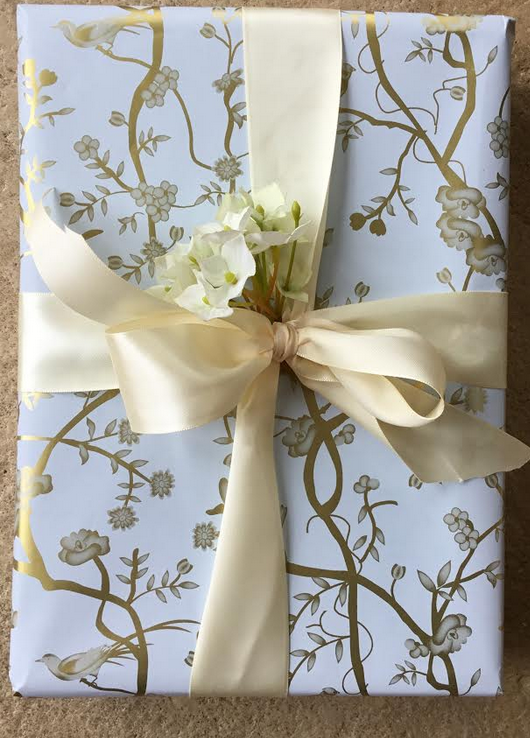 I tried all day yesterday to place an email order for your pale blue/gold gift wrap. It wasn’t listed in any category on your website. I wanted to order by email so I could use PayPal and pay immediately. How do I place my order? Please help. Thank you. I absolutely love the blue topiary with the blue check ribbon. Absolutely love the topiary paper and blue gingham ribbon is the best! You have truly outdone yourself on the wrapping paper designs! They are absolutely stunning! These are stunning!!! I especially love the large blue bunny and the wrapping papers. Thank you for making them available! I love the lemon topiary paper and the blue gingham ribbon! Your posts are always so motivating and delightful. I am such a fan of your gift wrap. I love the bunnies and the boxwood gift wrap? My favorite are the cute adorable bunnies.